Product code: ES7842 Categories: Art Deco, Art Deco Rings & Art Deco Engagement Rings. The designs of the Art Deco period of the 1920’s have remained popular through the decades, and here is a very beautiful 18ct gold and platinum 1920’s Art Deco era sapphire and diamond ring that sits so well on the finger and will always be loved and admired. Set with a lovely square sapphire that measures 0.60 carats, surrounding it amongst the most beautiful pierce work in platinum that also incorporates the 18ct yellow gold to highlight the design. The set into the border of the ring are a combination of different cuts of diamonds. The four smaller diamonds are the gorgeous rose cut diamonds, followed by the slightly larger six single cut diamonds and finally the eight European cut diamonds. These diamonds come together to total 0.24 carats and highlight both the design of the ring and the beautiful blue of the sapphire so well. Measuring 15.2mm by 9.9mm wide, the top of the ring leads to the band which has a split design to it adding another element of charm and character, and this is such an impressive ring to admire with details that is just extraordinary and will certainly continue to be admired by all who see it. 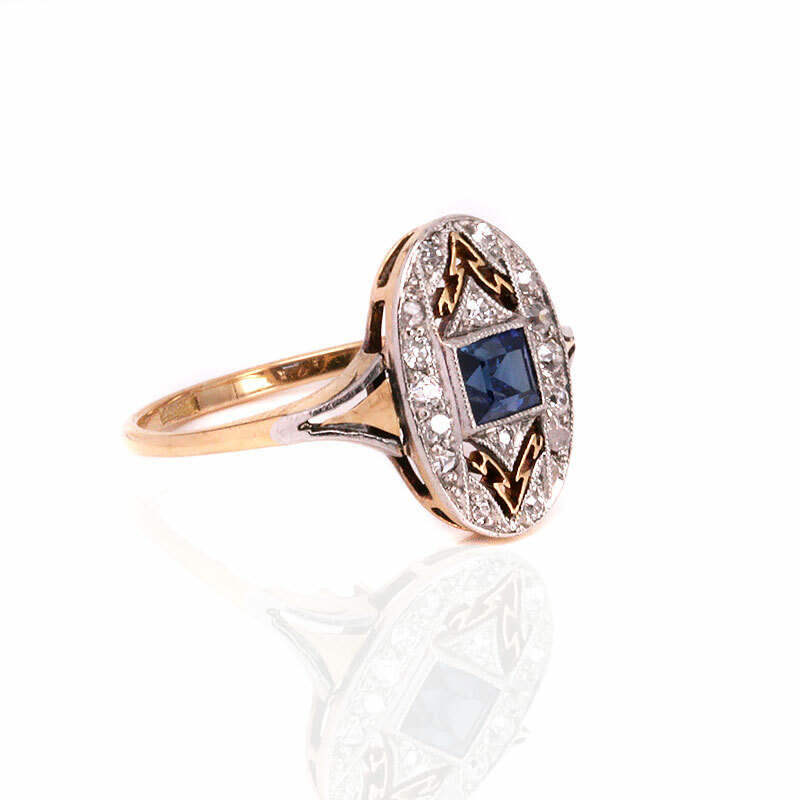 This Art Deco sapphire and diamond ring was hand made in 18ct yellow gold and platinum. Art Deco engagement rings are as popular today as when they were made in the fabulous 1920’s.